Joseph Minton has been designing and creating a myriad of beautiful projects from his Fort Worth office for nearly four decades. His medium is as expansive as his style. Dwellings range from beach houses on Mission Beach and Sea Island to pent houses on Nob Hill, from apartments on Park Avenue to log cabins on the Taylor River, Snake River and Aspen. Minton's work has appeared more than a dozen times in Architectural Digest, and numerous times in other publications including Southern Accents, Veranda, House Beautiful, Town and Country and Traditional Homes. He has been listed in "The AD 100: An Exclusive Guide to the World's Finest Interior Designers", and "Town and Country's Guide to the Top 55 Decorators in the U.S.". 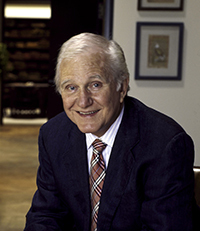 In 1996, Joe was awarded the prestigious ASID Designer of Distinction Award for lifetime achievement. Minton attended The College of William and Mary where he received his B.A. and later his Doctor of Jurisprudence from Southern Methodist University. Joe worked for several years as a City Attorney for the city of Fort Worth. As 1st Lieutenant in the United States Air Force, he served as Personnel Officer in England for several years. His first step toward a thriving Interior Design career was taken by managing the remodeling of a local bank while serving there as a Vice President and Trust Officer. Living abroad sparked a craving for European antiques, collectibles and design. In the early 70's, Joe formed his first interior design business with David Corley. The birth of Minton-Corley began the design legacy of Joseph Minton which has been a prominent influence in the Southwest for over forty years and continues to thrive and evolve. Joe Minton is proprietor and owner of Joseph Minton, Inc. (Interior Design Firm), the Minton-Corley Collection (fine European inspired furniture), and Joseph Minton Antiques (a collection of period English and Continental Antiques). He is a member of ASID, TAID, and is registered with the American Institute of Architects. Minton is also a board member of the Modern Art Museum of Fort Worth and the Van Cliburn International Piano Competition.